Peopled with remarkable and varied characters, the plot of The House on Shadow Lane required a skillful hand to keep events moving at its almost frantic pace while remaining believable. As Robert Heylmun weaves the lives of his characters into the nap of his plot, their connections produce the complicated, even twisted, events that make the novel captivating. 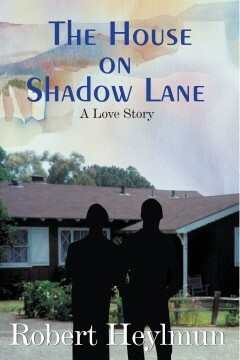 How, the reader wonders, will the romance developing between Hal and Simon survive the challenges they face? How will Carl, who is “in love with two people of different genders,” decide? While readers have likely never known such characters or situations, the author’s ingenious interplay brings them into vivid reality. As a result, readers will likely share on finishing this page turner, a “joyful sense of loss” that paradoxically occurs whenever I finish a novel I have much enjoyed. Good stories like this leave the reader to ponder what will happen next to those characters that he has come to know so well. The author’s story telling expertise establishes him as a writer whom readers of gay fiction will want to read again … and again. – Michael Dryden, American River College, Sacramento.